This savory treat was wonderful in many ways: light in texture, full of flavor, and low in fat and calories. 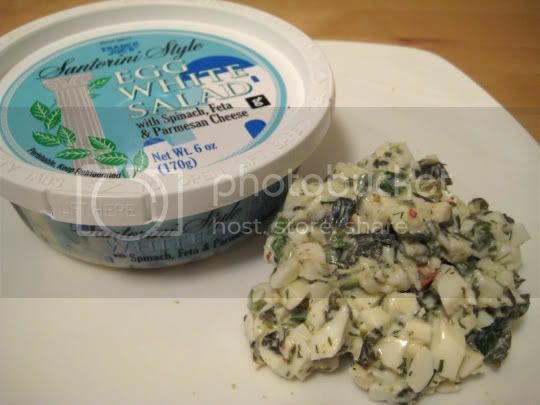 Chopped egg whites are mixed with chopped spinach, feta cheese, and parmesan. There's a creaminess to this salad that doesn't feel fat-laden, and its saltiness is the perfect match for a nice subtly sweet ciabbata bread. While great in sandwiches, this salad is also great for crackers or toast points. The feta flavor definitely comes through much stronger than the parmesan (I would have preferred it the other way around), but I guess that's to be expected for something "Santorini style." The only complaint I would have to give about this was the heavy dill flavor...and fresh dill, the most potent kind, which added sort of a pungent woodsiness that just seemed out of place in comparison with the other flavors. Ah well. Buy again? Probably...it's a nice cheap fix for a fast satisfying meal.